We all know landscapers can be exposed to noisy equipment and conditions, but doing something about it can seem daunting. Owners and supervisors might wonder, what’s the actual risk to workers? What does the Occupational Safety and Health Administration (OSHA) require? Or how do I get started? This article is intended to shed light on these topics and to outline the basic elements of a hearing conservation program (HCP) designed to protect workers’ hearing and meet OSHA requirements. The main reason to have a hearing conservation program is to protect workers from the harmful effects of noise. In the U.S., about 22 million workers are exposed to hazardous noise each year, and hearing loss is the third-most common chronic physical condition among adults after hypertension and arthritis. For the services sector (which includes landscapers), about 20 percent of noise-exposed tested workers have a material hearing impairment. Furthermore, for the subsector that includes landscaping, 54 percent of noise-exposed workers report not wearing hearing protection. Some reasons to believe your workers might be affected by noise on the job are if they hear ringing or humming in their ears when they leave work; have to shout to be heard by a coworker an arm’s length away; or they experience temporary hearing loss when leaving work. Basically, this means that OSHA requires landscaping companies to have an HCP when, over an 8-hour shift, the average worker exposure to noise is 85 dBA or above. The term dBA is just a way to express loudness that accounts for how the human ear works, and as a rule of thumb, workers typically have to shout to be heard in 85-dBA environments, like when a snow blower or gas-powered lawnmower is being used. Criterion and threshold levels: 80 dBA. Furthermore, in addition to yearly dosimeter calibration, dosimeters must be field-calibrated before and after measurements are taken. If you have never used a dosimeter before, there is no reason to be intimidated. Procedures can be found on the OSHA website, and following the manufacturer’s directions for your dosimeter should make the whole process relatively easy. Once it’s known that workers are exposed to noise levels at or above 85 dBA, employers need to protect workers from hearing loss, a fundamental requirement of OSHA regulations. Before an employer just hands out earplugs, OSHA requires that other types of controls are considered first, like using less noisy equipment or limiting worker exposure to noise. Often, the best way to protect workers from workplace noise is to purchase and use quieter equipment. Not only can buying quiet better ensure worker protection from noise, but it also creates a quieter workplace that can negate the need for an HCP and save money in the long run. When engineering or administrative controls are not practical, workers are to be given hearing protection devices (HPDs). First and foremost, NIOSH recommends that hearing protectors attenuate noise sufficiently to keep the worker’s daily exposure below 85 dBA as an 8-hour TWA. Although all hearing protectors are assigned a noise reduction rating (NRR), most workers do not receive the labeled amount of noise reduction. 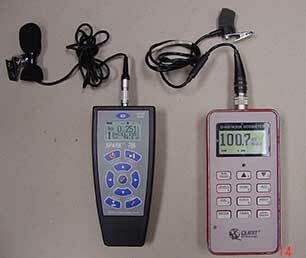 The best way to determine hearing protector effectiveness is to use HPD fit testing, which uses a computer program and special headphones to gauge the actual noise attenuation of HPDs worn by workers. Regardless of how you measure effectiveness, an essential element in using HPDs is proper training. Untrained workers are much less likely to wear their HPDs correctly (possibly rendering them essentially useless), and worse yet, untrained workers are less likely wear HPDs in the first place. When training workers, it’s important to keep in mind these basics: On-the-job training before exposure to noise and at regular intervals can be quite effective; ensure workers understand both the short-term and long-term hazards of noise; show workers how to use HPDs correctly; and have workers demonstrate they can insert them correctly. If you have established that your workers’ exposure to noise equals or exceeds an 8-hour TWA of 85 dBA, then audiometric testing (testing of workers’ hearing ability) is a required part of an HCP. The main thing to know is the tests must be performed by a professional certified by the Council of Accreditation in Occupational Hearing Conservation (CAOHC). Audiometric tests can be done on-site by mobile testing firms or you can send your employees to an occupational health clinic. Furthermore, the certified CAOHC professional can make recommendations about establishing and maintaining an HCP. As stated earlier, you may be required by law to establish and maintain an HCP. But if you do not document your efforts, then there is no evidence your company is meeting these requirements. Although there is a long list of OSHA requirements for proper record keeping, the basics are simple: Keep a record of all activities related to your HCP including any noise measurements, dosimetry, audiometry or training. Another good reason to keep good records is to evaluate your program over the long term. Looking back at records can help you meet necessary OSHA requirements, determine if noise exposures are getting worse or better over time and identify problem tasks or equipment that might need added attention. Furthermore, evaluating audiometry results over time can give you a strong indication as to whether workers’ hearing is being affected by workplace noise.